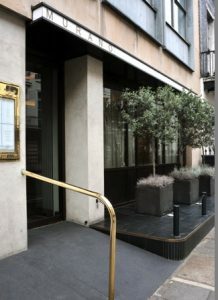 Murano, Angela Hartnett’s Mayfair Restaurant, is housed in a rather unpromising looking apartment block in Queen Street. Its Italian antecedents are clearly signalled, though, by its elegant exterior. Three large potted olive trees stand before the shaded plate glass window and a plain white fascia is broken only by the word “Murano” in small discreet silver letters. My Companion and I arrived during a brief wan sunny interval on a typical rainy London “summer” day. The watery sunshine did little to enhance the implication that Mediterranean indulgence and generosity might lie within. Still, we were greeted with enough warmth to offset the chilly weather and shown to seats in a slightly elevated section at the back of the restaurant facing a window into the kitchen. As I expressed interest in the goings on in the kitchen, MC kindly swapped seats with me so that I had the better view. The décor is pale almost to the point of insipidity, with much white, some taupe and just a hint of colour in the peculiar looking modern “chandeliers”, which seem to consist of some old mismatched lampshades on Miro-ish angular frames adorned with random coloured lozenges of I-know-not-what. There are all the usual Michelin star touches, copious flowers (white lilies), a dark coloured bar accessorised with some bottles of champagne in grand sliver ice buckets, mirrors, and enough linen and crystal to lift the whole effect from the wan to the luxurious. The armchair style seats that we were allotted were blissfully comfortable. The nibbles that arrived whilst we sipped our aperitifs, a large sliver of crisped parmesan in a miniature silver saucepan, and some tiny rice and wild mushroom aracini, were a promising start, a powerful shot of umami to awake the senses. As neither of us are particularly knowledgeable about Italian wine, we sought advice from the sommelier. In this case I broke my usual rule of thumb in such places, which is, choose a style you like and then choose the second cheapest of this type on the list, and ordered the cheapest. Alas it was not available. More debate ensued and in the end we rather unadventurously chose a Pinot Grigio. At this point, in the spirit of living the experience to the full, we both chose the tasting menu., and were then duly distracted by the arrival of a plate of beautiful rose pink ham, a ramekin of deep green olive oil and a basket of warm breads. The ham was sweet delicate and slightly nutty, the bread was delicious. I had particular trouble resisting the potato foccaccia. It was difficult not to scoff the lot and spoil our appetites for the main event. Luckily the wine arrived for tasting next, I tasted it and was delighted. This was Pinot Grigio from heaven! Smooth zingy supple and with the slightest hint of flintiness, more like a top flight White Bordeaux than the usual PG that we’ve all come to know from wine bars. The first course of asparagus with watercress coulis and morels looked beautiful with the pea green coulis contrasting with the pale asparagus. The flavours were well balanced with the peppery watercress reduction nicely offsetting the full flavour of the white asparagus. The morels were cooked until slightly crisp giving then an amazing depth of fungal flavour with an almost bacon like aftertaste. The squid ink tagliatelle with crab which arrived shortly afterward was faultless, with sweet crab meat complementing the subtle maritime tang of the squid ink in the deliciously silky hand made tagliatelle, which were served perfectly all dente, The whole dish was enlivened by just a hint of chilli and ginger. Fairly traditional but oh so accomplished. The service throughout was lovely, professional without being cold and friendly without being patronising. There was a fair amount of ceremony though, which MC punctured by disappearing to the bathroom just as a waiter emerged from the kitchen with a flourish, bearing aloft a tray on which were two impressive silver domes that were clearly keeping out main course warm. He caught sight of MCs rapidly retreating back, caught my eye and we both giggled, it’s that kind of place. With MC back in place it was time for the waiter to repeat his grand entrance and serve the main course. This was fillet steak tomato jam and capers. The steak was cooked rare, tender and deeply flavoured, it had evidently been hung properly and was obviously of impeccable provenance, though I did not keep a note of its origins, even if they were on the menu.. To be honest the accompaniments added little as the meat itself was so good. After a palette cleansing sorbet the desert was presented, with only slightly less ceremony than the steak had been. It was Hazelnut torte popcorn Ice cream. Despite my not really being a “pudding person” this was a triumph. The hazelnut torte was rich and dense and the popcorn Ice cream had a deeply caramelised taste which offset it perfectly. And yes, there was a scattering of popcorn on the plate and a couple of ripe and luscious strawberries to add a touch of sourness to the ensemble. Just deeply, deeply delicious! The bill arrived promptly when we asked for it, a particular bugbear of mine is being forced to sit around at the end of a meal with nothing to distract you, waiting for the privilege of paying for it. In this case, however the timing was perfect. As you might expect, this is a seriously expensive restaurant. However the whole experience is well worth it. We left feeling not only well fed but happy and special, as though we had just been for a wonderful meal at a good friend’s house which just happened to have a world class chef in the family. I can’t wait to save up and go back for another try.